Drum Muff | Why Drum Muffs and Cymbal Mutes? Why Drum Muffs and Cymbal Mutes? 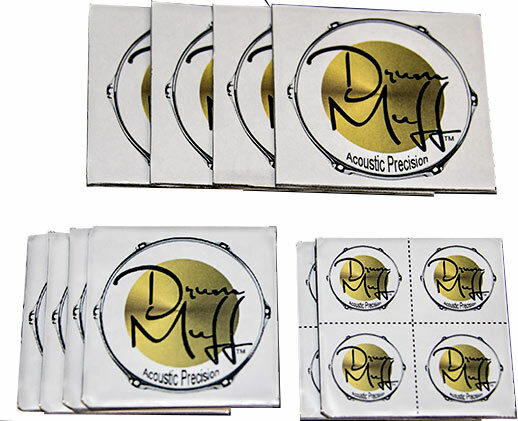 Mega Pack of Drum Muffs 2″ or 1″ Squares that you cut to size. Are you still using Moongels, duct tape, gaffers tape, drum rings, window flashing, tampons, hot rod sticks, flix sticks, Lidwish sticks and pillows? The next generation hybrid Drum Muffs will take the place of all of these while doing a much better job. Yes, Drum Muffs actually enhance the sound of drums and cymbals. We have dozens of professional drummers using these and every single one tells us Drum Muffs are game changers. They love them! Drum Muffs are not just for drum dampening and ridding ring and unwanted harmonics. They gate the drums, reduce volume by 3db and also enhance the sound while preserving attack, tone and cymbal wash. 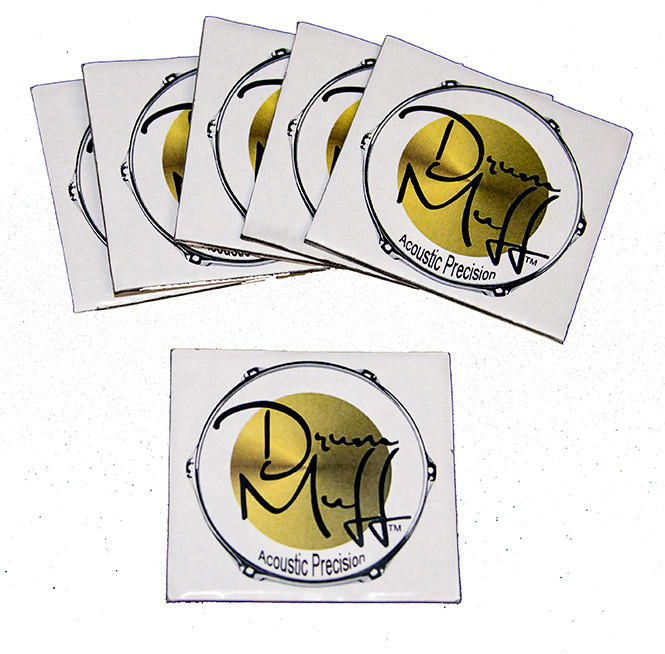 Nothing on the market is remotely close to what our patent pending Drum Muffs can do. The secret is a multi-layered hybrid product with 5 mils of aluminum as one of the layers. This is a state of the art formulation. Every other solution is a low tech solution. All too often crash and high hat cymbals are too loud. If you are being honest with yourself, you will realize that cymbals are being picked up heavily in the vocal microphones in most situations and they are slightly too loud. If you want to play the way you normally play, simply place a small Drum Muff just below the bell of the cymbal to reduce the volume by up to 3db (without changing the dynamics or tone of the cymbal). Recording studios tell us they put a small Drum Muff inside the bells of the high hats to reduce the volume slightly. You can also change the sound of the cymbal by moving it further away from the bell. Those who say “play with dynamics” are NOT hearing what engineers hear. Every cymbal, when hit the same, will have a different volume level. It is near impossible for a drummer to hit each cymbal with a different “touch” based on achieving an equal volume level. Drum Muffs allow you to dial in exact volume levels. You can also play around with locations of the Drum Muffs near the center of the cymbal for different sounds. Get a trashy, dark sound without buying a new cymbal! 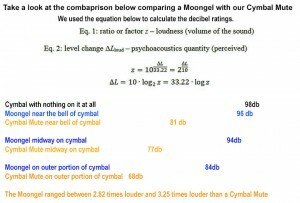 Click on the text below to see a comparison between Cymbal Mutes and Moongels. Cymbal Mutes can achieve a reduction in sound of a factor of 8 times on a cymbal. If you want to drum at home and effectively reduce the volume – Drum Muffs is the only solution allowing you to play with your regular sticks. 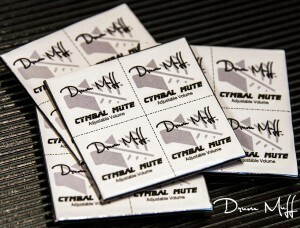 You can even place these on the bottom of your cymbals. They will not fall off and they can be removed and moved to different locations on the cymbal to effect varying volumes and tones. You will be blown away with the sound that the Drum Muff enables on your snare. Get that “Fat” sound you have been looking for. You can get rid of unwanted high pitched harmonic sounds, unwanted resonance, and even lower the volume if you like. You control the degree of volume and the amount of resonance control. The Drum Muff can make a ringy sounding snare sound awesome! Using Drum Muffs on a snare can give you different sounds depending on the placement. Want a rich thuddy sound? A crisp sound? An open tone sound? You can do it all with Drum Muff depending on the placement. It is like changing heads, but you can do this in seconds. Get the sound you want, for the song or gig you are doing – instantly. Most will use one to three small Drum Muffs around the perimeter of the batter head. Many also use a medium Drum Muff near the snare wires on the resonant head. Move them around for the sound you want. Almost all drummers put something inside the kick drum. Many put pillows, towels or blankets inside. All of these solutions are also absorbing the sounds that you want to hear. Let your kick drum breathe! Get rid of all of the “junk” inside and simply place four large Drum Muffs on the resonant head. You can place them on the inside or outside. Drum Muffs, unlike pillows, are discriminating in frequency reduction. The multi-layering of Aluminum and other materials clip off the unwanted booming sounds and frequency harmonics while allowing the real “tone” of your kick drum to come through. Think about it. Would you put a pillow inside a speaker cabinet? Heck no! That is exactly what you are doing when you put any size pillow inside a kick drum. If drum manufacturers felt their shells needed dampening, they would include damping material with the shells. The issue is the heads. We take care of the issue without disturbing the wide open sound available from the shell. Installation takes seconds. Just peel and stick! When considering location, lightly place the Drum Muff on the cymbal or drum. It will be easy to move it. They can be placed either on top or the bottom of the cymbal and the batter and resonant heads of drums. We don’t believe the adhesive will harm the drum heads or the cymbals. Best yet, you don’t have to worry about them falling off like other solutions. Our Drum Muffs will not leave any residue. If the Drum Muff adhesive looses strength, it is due to dirt and oil. These are easily washed off with soap and water. The entire Drum Muff is water proof. Once dry, the original adhesion returns! Bands that play in small venues are constantly fighting volume issues. Drums and cymbals are always the problem. Bring the volume down by 3 to 9 db while enhancing the sound of the drums and without changing the sound or attack of the drums and cymbals. If you are using drum practice pads you know they ruin the feel of playing the drum. If you are playing at home, use two medium Drum Muffs (or for more volume reduction, Cymbal Mutes) on each drum and place one Cymbal Mute on each cymbal near the middle of the cymbal. You keep the feel and lose the volume. Why pay $60 for the Moongel workout pad when you can use your own kit and keep the feel of your drums? This is what Moongel advertises: Are your toms not thuddy enough? A little too much ring on your cymbals? Does your snare need more snap and less resonance? Drum Muffs are significantly better at all of these issues at a fraction of the cost of Moongels. Plus, our Drum Muffs don’t melt in the heat, nor do they attract dust and fuzz. You can also get a custom logo on them. Your band name, any photo… whatever you like, we can do it! AND… they won’t melt, get sticky, collect fuzz or stick together. One 2″ Cymbal Mute can make your cymbal as quiet as hitting a block of wood – or only reduce the cymbal volume by 3 db by cutting one into quarters. You choose any volume you like, in seconds! There are solutions out there that dampen cymbals. Virtually all of them give you ONE volume option and many do not offer the “feel” of a real cymbal. 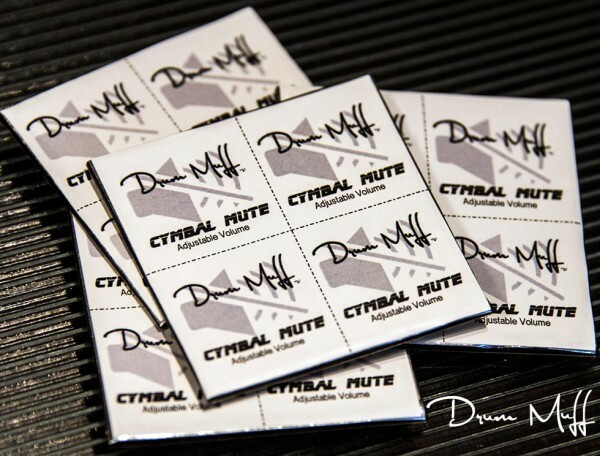 Our Cymbal Mutes are infinitely adjustable in volume. From dead quiet to a reduction of only 3db. There is NO other product that offers such variation in volume. Use your existing cymbal and invest just $14.99 for 4 Cymbal Mutes.